Two horses have died after being hit by a car on a busy road in East Ayrshire. Police Scotland said they were called to the scene at about 05:30 after reports of horses being loose next to the A77 near Kilmarnock. The force confirmed both horses died from their injuries. The driver of the car was not injured. A northbound section of the A77 was closed for nearly two hours as a result of the accident. 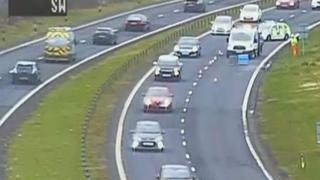 The incident, which occurred near to the Meiklewood Interchange between Fenwick and Kilmarnock, caused long tailbacks. The road reopened shortly after 08:00. A spokeswoman for Police Scotland said: "Police were called around 5.25am on Wednesday morning to the A77 northbound at junction eight after a car struck two horses that had got loose from their field. "An ambulance attended and checked over the driver of the car who was badly shaken, but not injured.